Kind-hearted pet lovers, ambulance drivers, journalists and animal welfare experts united for the emergency operation to stop the young dogs being mummified in the gluey bitumen. All looked lost for the litter when a barrel of tar collapsed, coating the youngsters head to tail and leaving them struggling to breathe. Yet the puppies’ loud whimpering encouraged the community to come together for a fraught clean-up operation. Images released today by Humane Society International (HSI) show how the rescuers spent hours wiping away the thick tar from the puppies so they could eventually be reunited with their mother. HSI rescuers drove for two hours to help out at the Keralan coastal town of Tirur after an appeal from local government officials to help save the dogs. The town has historically witnessed conflict between residents and roaming packs of street dogs, but the past tensions were quickly forgotten as the puppies clung on to life. 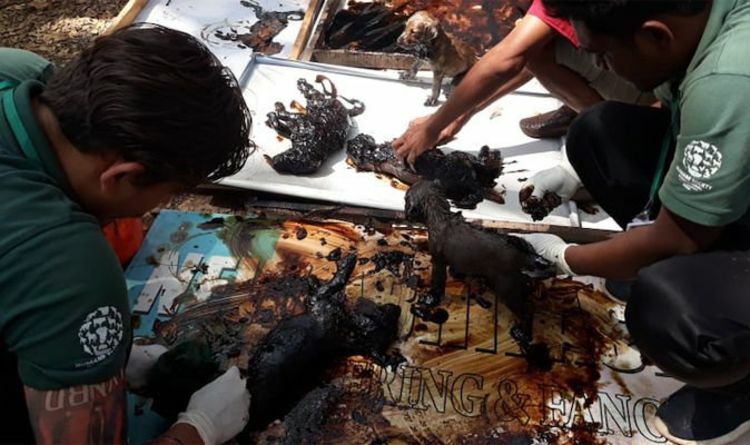 Using copious amounts of vegetable oil, the rescue team was slowly able to clear away the thick layers of tar that made it impossible to determine the colour of the puppies’ coats. Sally Varma from HSI/India was part of the animal rescue efforts when Kerala was devastated by flooding last year and has been working with the local community to promote humane street dog management. She said: “This was such an awesome community effort because there is absolutely no doubt that these puppies would have died had the local people not come to their rescue. “The tiny puppies had been trapped in the tar for many hours, and were exhausted as well as overwhelmed by the noxious fumes. The puppies were later taken to the HSI/India rescue centre at Nilambur where they will be vaccinated and sterilised before being transferred back to Tirur to become pets.